For other uses, see Central Russia. Russia in Europe and Asia with current administrative divisions (de facto boundaries[note 1]). The boundaries between continents are almost exclusively determined by geography, with the one exception being that the eastern boundary of Europe is generally considered, by convention, to run along the Ural Mountains, the Ural River, the Caucasus Mountains, the Turkish Straits. The southern part of Russia has some small areas that lie geographically south of the Caucasus Mountain range, and therefore are geographically in Asia; this territory includes the city of Sochi. 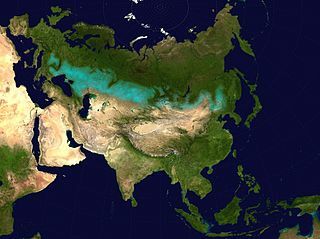 The other, eastern, part of the Russian Federation forms part of northern Asia, and is known as North Asia, also called Asian Russia or Siberia. Europe also forms a subcontinent within Eurasia, making all of Russia a part of the Eurasian continent. Some theories say that some early Eastern Slavs arrived in modern-day western Russia (also in Ukraine and Belarus) sometime during the middle of the first millennium AD. The Eastern Slavic tribe of the Vyatichis was native to the land around the Oka river. Finno-Ugric, Baltic and Turkic tribes were also present in the area (although large parts of the Turkic and Finno-Ugric people were absorbed by the Slavs, there are great minorities in the European Russia today). The western region of Central Russia was inhabited by the Eastern Slavic tribe of the Severians.The population of European Russia was composed of Slavic, Finno-Ugric, Turkic, Caucasian, Scandinavian, Baltic, Finnic, Khazarian, Hungarian and Norse peoples. One of the first Rus' regions according to the Sofia First Chronicle was Veliky Novgorod in 859. In late 8th and early-to-mid-9th centuries AD the Rus' Khaganate was formed in modern western Russia. The region was a place of operations for Varangians, eastern Scandinavian adventurers, merchants, and pirates. From the late 9th to the mid-13th century a large section of today's European Russia was part of Kievan Rus'. The lands of Rus' Khaganate and Kievan Rus' were important trade routes and connected Scandinavia, Byzantine Empire, Rus' people and Volga Bulgaria with Khazaria and Persia. According to old Scandinavian sources among the 12 biggest cities of Kievan Rus' or Ancient Rus' were Novgorod, Kiev, Polotsk, Smolensk, Murom and Rostov. Through trade and cultural contact with Byzantine Empire, the Slavic culture of the Rus' adopted gradually the Eastern Orthodox religion. Many sources say that Ryazan, Kolomna, Moscow, Vladimir and Kiev were destroyed by the Mongol Empire. After the Mongol invasion the Muscovite Rus' arose, over all this time, western Russia and the various Rus' regions had strong cultural contacts with the Byzantine Empire, while the Slavic culture was cultivated all the time. The elements of East Slavic paganism and Christianity overlapped each other and sometimes produced even double faith in Muscovite Rus'. In fourteenth century Muscovite Russia served as the intermediary in the trade between Europe and Persia as well as Turkey. During all this time, Russian culture had not only strong cultural links and exchanges with Central Europe and Asia, but also with its many ethnic minorities which exist until today in Russia, like Tatars, Ukrainians, Finno-Ugrics, Bashkirs and Chuvashs. While Russia evolved over periods of time with a balanced European influence, it was tsar Peter the Great who wanted to reform Russia and bring it up to a true Western standards and way of life. Peter the Great was able to change Russian society partly, resistance existed among peasants, the traditionalists and Old Believers within the Orthodox Church. With the Soviet Union, Russia was cut off from Western culture. In the nineties, the Russian political elites hoped to integrate Russia into the West. The Russian culture was shaped for centuries by the Orthodox faith, Slavic traditions, the Cyrillic script, the geographical location between Europe and Asia. Western Russia has French, Polish, Lithuanian and German influences, from 1500-1945. The administrative districts (on a large scale called federal districts) of the Russian Federation do not exactly line up with European Russia, but they are decent approximations, depending on exactly how Europe is defined. There are two major trends, one to use administrative divisions north of the mouth of the Ural River and one to draw a line of falseness from the Ural River, through the town of Yekaterinburg. ^ a b Includes the Republic of Crimea and the city of Sevastopol which are de facto administrated by Russia but considered part of Ukraine by most other states. Volga Federal District has 4 raions entirely in Asia, one raion mostly in Asia, one raion bisected between Europe and Asia, two cities bisected between Europe and Asia and one settlement fully in Asia, which amount to 280,000 people living in 30,000 km² in Asia (as defined as east of the Ural River). Ural Federal District has roughly 200,000 people living in 1,700 km² in Europe (west of the Ural River). ^ Compare: Hans Slomp (2011). Europe: A Political Profile. Retrieved 2014-09-10. Russia occupies the eastern parts of the European subcontinent and the northern part of Asia. ^ a b c Vishnevsky, Anatoly (15 August 2000). "Replacement Migration: Is it a solution for Russia?" (PDF). EXPERT GROUP MEETING ON POLICY RESPONSES TO POPULATION AGEING AND POPULATION DECLINE /UN/POP/PRA/2000/14. United Nations Population Division, Department of Economic and Social Affairs. pp. 6, 10. Retrieved 2008-01-14. ^ "Early East Slavic Tribes in Russia". Study.com. Retrieved 2018-12-19. ^ "Khazar | people". Encyclopedia Britannica. Retrieved 2018-12-19. ^ Reuter, Timothy (2015). The New Cambridge medieval history. Fouracre, Paul,, McKitterick, Rosamond,, Reuter, Timothy,, Luscombe, D. E. (David Edward),, Riley-Smith, Jonathan, 1938-2016,, Abulafia, David, (First paperback ed.). Cambridge: Cambridge University Press. pp. 497–500. ISBN 9781107449060. OCLC 945367493. ^ James., Minahan, (2004). The former Soviet Union's diverse peoples : a reference sourcebook. Santa Barbara, Calif.: ABC-CLIO. pp. 15–16. ISBN 9781576078242. OCLC 659831641. ^ "Ancient Rus: trade and crafts :: History of Russian trade and crafts :: Business & Law :: Russia-InfoCentre". www.russia-ic.com. Retrieved 2019-03-20. ^ Orthodox Russia : belief and practice under the tsars. Kivelson, Valerie A. (Valerie Ann), Greene, Robert H., 1975-. University Park, Pa.: Pennsylvania State University Press. 2003. ISBN 027102349X. OCLC 50960735. ^ Orthodox Russia : belief and practice under the tsars. Kivelson, Valerie A. (Valerie Ann), Greene, Robert H., 1975-. University Park, Pa.: Pennsylvania State University Press. 2003. p. 146. ISBN 027102349X. OCLC 50960735. ^ Kirsanova, Raisa. "Russia: History of Dress". LoveToKnow. Retrieved 2019-03-03. ^ "Who are the Mordvin People?". WorldAtlas. Retrieved 2019-03-20. ^ ""Europe as a Common Home"" (PDF). ^ English, Robert David; Svyatets, Ekaterina (Kate) (2014-03-04). "Soviet elites and European integration: from Stalin to Gorbachev". European Review of History: Revue européenne d'histoire. 21 (2): 219–233. doi:10.1080/13507486.2014.888710. ISSN 1350-7486. ^ a b c d e f g "Population 1 January 2015 Estimate – Federal State Statistics Service Russia". Federal State Statistics Service Russia. Slavs are an Indo-European ethno-linguistic group who speak the various Slavic languages of the larger Balto-Slavic linguistic group. They are native to Eurasia, stretching from Central, Eastern, and Southeastern Europe all the way north and eastwards to Northeast Europe, Northern Asia (Siberia), and Central Asia, as well as historically in Western Europe and Western Asia. From the early 6th century they spread to inhabit the majority of Central, Eastern and Southeastern Europe. Today, there is a large Slavic diaspora throughout North America, particularly in the United States and Canada as a result of immigration. The East Slavs are Slavic peoples speaking the East Slavic languages. Formerly the main population of the loose medieval Kievan Rus federation state, by the seventeenth century they evolved into the Belarusian, Russian, Rusyn and Ukrainian people. Volga Bulgaria or Volga–Kama Bulghar, was a historic Bulgar state that existed between the 7th and 13th centuries around the confluence of the Volga and Kama River, in what is now European Russia. The Chuvash people are a Turkic ethnic group, native to an area stretching from the Volga Region to Siberia. Most of them live in the Republic of Chuvashia and surrounding areas, although Chuvash communities may be found throughout the Russian Federation. Chud or Chude is a term historically applied in the early Russian annals to several Finnic peoples in the area of what is now Estonia, Karelia and Northwestern Russia. The continent of Asia covers 29.4% of the Earth's land area and has a population of around 4.5 billion, accounting for about 60% of the world population. The combined population of both China and India are estimated to be over 2.7 billion people as of 2015. Asian population is projected to grow to 5.26 billion by 2050, or about 54% of projected world population at that time. Population growth in Asia was close to 1.2% p.a. as of 2015, with highly disparate rates, many West Asian countries showing growth rates above 2% p.a., and notably Pakistan at 2.4% p.a., offset by a growth rate below 0.5% p.a. in China. The Volga Finns are a historical group of indigenous peoples of Russia living in the vicinity of the Volga, who speak Uralic languages. Their modern representatives are the Mari people, the Erzya and the Moksha Mordvins, as well as extinct Merya, Muromian and Meshchera people. The Permians are sometimes also grouped as Volga Finns. The Grand Duchy of Moscow, Muscovite Rus' or Grand Principality of Moscow was a Rus' principality of the Late Middle Ages centered around Moscow, and the predecessor state of the Tsardom of Russia in the early modern period. The Rus' people are generally understood in English-language scholarship as ethnically or ancestrally Scandinavian people trading and raiding on the river-routes between the Baltic and the Black Seas from around the eighth to eleventh centuries CE. Thus they are often referred to in English-language research as "Viking Rus'". The scholarly consensus is that Rus' people originated in what is currently coastal Middle Sweden around the eighth century and that their name has the same origin as Roslagen in Sweden. Kievan Rus' was a loose federation of East Slavic and Finnic peoples in Europe from the late 9th to the mid-13th century, under the reign of the Varangian Rurik dynasty. The modern nations of Belarus, Russia, and Ukraine all claim Kievan Rus' as their cultural ancestors, with Belarus and Russia deriving their names from it. Northwest Russia or Northern European Russia can be roughly defined as that part of European Russia bounded by Finland, the Arctic Ocean, the Ural Mountains and the east-flowing part of the Volga River. Although it was never a political unit there is some reason for treating it as a distinct region. The Squat Dance or Russian Squat Dance is a important characteristic of Russian folk dance since ancient times. Russian culture arose from Slavic, Finno-Ugric, Tatar, Viking and Turkic peoples and were much influenced by eastern and western cultures from Asia and Europe, mainly of Scandinavian and Baltic regions, as well from the cultural space of the nomadic Eurasian steppe cultures. The Squat dance originated in Russian lands where Eastern Slavic people lived and where later the Russian states appeared, in Europe also known as Rus'.